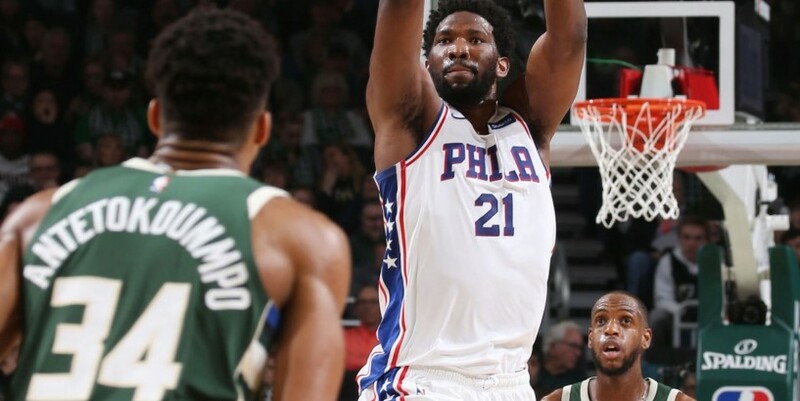 Joel Embiid scored 40 points and grabbed 15 rebounds as the Philadelphia 76ers held off the Milwaukee Bucks, despite 52 points from Giannis Antetokounmpo. NBA Conference standings Who's leading the East? WHo's leading the West? It was Embiid's 52nd double-double and the 25th time he has scored at least 30 points and swept 10 rebounds in a game. He scored 18 points alone in the fourth quarter. Image: Joel Embiid launches a three-pointer over Giannis Antetokounmpo Giannis Antetokounmpo was terrific for the Bucks with a career-high 52 points to go along with 16 rebounds and seven assists. Khris Middleton added 19 points. The Sixers built a 62-53 lead at half-time thanks in large part to Embiid's double-double of 16 points and 10 rebounds. Antetokounmpo appeared to tweak his ankle with 1:40 remaining in the third but remained in the game to shoot the two free throws as the fans chanted "MVP!" Philadelphia came out aggressive in the fourth and extended their advantage to 98-86 with 9:34 left when Mike Scott drained a three-pointer. Butler responded in a big way with a three-pointer to put the Sixers back ahead by 11.